Ellie loves to build things, drawing up plans and using her impressive array of tools to create and build all manner of innovative projects. When her best friend Kit's birthday is approaching, and the friends overhear that Kit is getting Miss Penelope, a dog, Ellie sets out to build a dog house. She needs some help, and even though the neighborhood boys are annoying, she enlists the help of Toby for a lot of the project. She also asks some other girls to help with the wall paper, and as the project progresses, has to keep a lot of secrets from Kit. When Ellie is afraid that the house won't be done in time, she has a large group of people to help her, and invites them all to Kit's beauty pageant party. Luckily, everyone is understanding, and Ellie's project is a big hit. Strengths: This is absolutely on trend for how young girls with progressive parents are being raised today. Pink and sparkles are okay, and so are wrenches and building things. 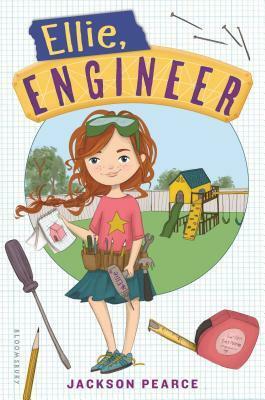 Lots of STEM sorts of issues, and Ellie is insistent that she is an engineer. The friend drama is true to life, and it's nice that all of the children eventually learn to work together. There is even a bit of a twist at the end. Weaknesses: This would be a hard sell for middle school, and the initial reaction to the boys alarmed me a little, although Ellie did manage to work things out with everyone and establish that while boys sometimes do stinky things, this doesn't make all of them stinky all the time. What I really think: This just made me feel old. When my daughters were this age 20 years ago, the philosophy was just different, and I can't quite explain it. There was a feeling that we shouldn't really differentiate between "girl stuff" and "boy stuff", and everyone should wear primary colors and have dolls AND trucks. My older daughter went through a phase where she would answer "chemical engineer" when asked what she was going to be when she grew up. My younger daughter wanted to be a super hero princess, which is why I encouraged more gender neutral trappings for everyone because I'm still not a fan of pink and sparkles. Now, the philosophy seems different. Too many women claim "I'm not a feminist", but still have a full time professional job that my mother could only have dreamt about. Little girls dress up as pink princesses but still think they can be CEOs. I find myself feeling vaguely annoyed not because of the amorphous change of philosophy, but by the fact that so much time has passed! To my credit, my older daughter is working in organic farming, and my younger one is in college to be either a forensic account or an actuary, so I think I did okay with math and science and girls!